Mental Health and More...: Get Out of My Room! I am sure that many of you have heard the term “boundaries” before. How often have you wondered what exactly did this psychobabble mean? The above picture is a good depiction of what boundaries can be. 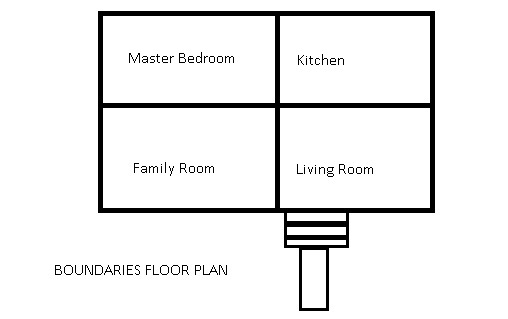 It is a basic floor plan of a house with a family room, living room, bedroom, and kitchen. I cannot take credit for this boundaries depiction, but I will happily use it. Boundaries are rules and limits that we individually set with our relationships in order to maintain interpersonal and intrapersonal respect and safety. In layman’s terms…it is how close or emotionally intimate we choose to be with every person we know. The illustration above is a visual example of how we can set boundaries. Think about the symbolism of each room in the illustration. A living room in a home is very formal and conversations and closeness is very surface-oriented. The living room is where we let sales people in to our home to vacuum our carpets or to share a message. We do not disclose much about ourselves. The room is somewhat superficial. The family room is much more intimate. It is where we sit down with family and friends to enjoy a movie, a football game, eat popcorn, and play games. In this room you will find light-hearted laughter and enjoyment, and even the occasional late-night discussion. It is intimately deeper than the living room. The kitchen is where a family sits for meals and to share their day-to-day goings-on. Learning and teaching opportunities occur, and understanding is attempted. It is a much deeper place with relationships due to the nurturing and nourishing nature of the room. Finally, the master bedroom. This is the holy of holies in closeness and intimacy. There, we expose ourselves to who we really are and it requires extreme closeness, vulnerability, mutual respect, and safety. Love is nurtured on its deepest level. If personal boundaries were a house, we would be the ones to decide who is allowed in each room. We can allow people into rooms and even have them leave when they no longer belong. Sometimes, people try to push themselves in to rooms where they don’t belong. We have a right to kindly push them back to where they belong. It is our decision where people should or should not be. We set the rules, we set the boundaries. Think about it. Try it out.